Come enjoy staying in our ocean view villa in Porta Fortuna, the most renowned, high end, luxury development within the gates of Punta Mita. You will have access to five star hotel type amenities such as private beach club access, room service, private concierge, private chefs and cleaning staff. Our villa is approximately 4 000 square feet of indoor and outdoor space, a three bedroom, three and a half bath gem with unobstructed ocean views from every part of the property except one bedroom (but that second master bedroom has a private patio with waterfall). The home sleeps ten guests. The home has a private pool with direct views of the ocean, a private hot tub off of the upstairs lanai, also featuring direct views of the ocean. Plasma screen televisions and full satellite service (offering all the channels you get at home and all available movie channels) in each bedroom, full home stereo system (with zones all over the house and outdoor space), Sonos music library and a very large personal digital music library as well as a 300 movie digital library with many new releases and iPod speaker docks in every bedroom. The stylish yet commercial level kitchen features imported Italian cabinets (Scavolini), a Miele stove, a Viking refrigerator, a Miele dishwasher, granite cabinets making it a true chef's delight. The home is furnished with designer custom crafted pieces and as you can see from the photos, is the ultimate in luxury with every feature you can imagine (many homes in Punta Mita are furnished with lower end furniture designed for renters, ours have been furnished for people who expect the same level of design, furnishings and art as the Four Seasons or the St. Regis). The Porta Fortuna development is made up of three areas of homes. There is a row of beachfront homes, a row of ocean view homes behind those and then 14 zen casitas. The land has been meticulously graded so that all properties have wonderful views. 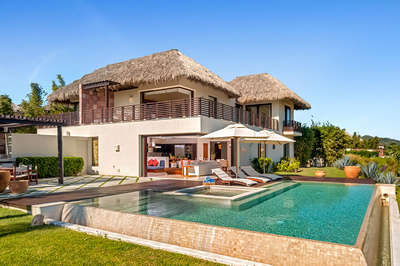 The villas facing the ocean have unobstructed panoramic ocean views from the everywhere on the property (master bedroom, upstairs bedroom, kitchen, living room, dining area, pool, hot tub, outdoor dining area, outdoor barbecue area). Personalized residence or villa orientation tour. Preferential tee times and a special greens fee rate. Use of the Residents' Beach Club (subject to prior reservation and availability). In-house or villa spa services. Booking of tours and excursions. It's a beautiful property. Amanda was a huge helping us find this property.